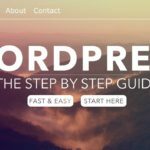 Learn how to create a website in 24 easy steps. Step by step with no step skipped. With the new template system you will have the most professional website on the most popular platform (WordPress) in the entire world. Learn to get your domain name, hosting, install WordPress, create your website, make a logo and the best tips and tricks to make your website #1.